Exercise progression is the take away tip in Turbulence Training Day 8. Home fitness workouts that'll burn fat and sculpt your body in 4 weeks. 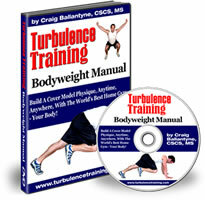 Welcome to day 8 of Turbulence Training's Buff Dudes and Hot Chicks fat burning workout. "Hello and welcome to Day 8 of Buff Dudes and Hot Chicks Turbulence Training workout. I'm Asad from Better4Fitness.com, and you can check out today's exercises down below if you're on Better4Fitness.com, if you're not then get there now, have a look and check it out. So today's workout felt really good, I mean what a difference a week makes, it's unbelievable! It's definitely true that you make the most advances within the first few weeks of a new training program. Compared to Day 1, today felt so much better. It was the same workout from Day 1 and this time I completed all the sets within the supersets. But I still only managed half the interval training at the end. Which is OK, it's not great but it's OK because it's a work in progress still. It's the second week, by the fourth week I will have the interval training down! I'll complete it and if I don't then I'm sure I won't hear the end of it from you guys. So that's not even a choice, it's something I'm building up to and something I WILL do (exercise progression). So today was a good day, Day 8. Stay tuned for the speed mash up of today's workout, and I'll see you tomorrow, take care."